Derbyshire, like most English counties in the Victorian and Edwardian periods, produced few female photographers. That's not to say women didn't have a presence in the photographic industry. If one includes all of the photographic-related trades, then the number was substantial, as women were often employed in a number of subordinate roles in photographic studios, particularly in the 1890s and early 1900s. Their job descriptions ranged from photographic assistant to photographer's printer and retoucher, but they seldom received recognition in the studio name, even if it was a family business. There were plenty of "& Sons" dynasties, but I've yet to come across an "& Daughters" firm, discrimination that was hardly confined to the photographic industry. Sadly, very few women graduated to being photographers in their own right, since the successive expectations of marriage, housewifely duties and children tended to obstruct such career development. The first recorded female photographer to work in Derbyshire was a Miss Scales of Nottingham, who visited Matlock Bath with John Scales (possibly her brother) in the summer of 1859. She was probably Elizabeth J. Scales (1825-), daughter of Nottingham insurance agent George Scales. In February 1862 Elizabeth Scales married Michael Hutton in St Petersburg, Russia. Gertrude Fletcher (1859-1930) of Ripley was a significant exception to the general trend. After working as a photographic painter - perhaps a colourist - for her brother-in-law Abraham Booth in Ripley during the early 1880s, she set up her own studio at Hyson Green, Nottingham in the early 1890s. She continued operating until at least 1906. Miss Ethel Margaret Ames (1880-1964), who was also a china painter at the Royal Crown Derby works, operated a studio in Lower Dale Road, Derby from 1895 until her marriage to Percival Rawson in 1907. Although the census records her living with her husband in Nottingham by April 1911, she may have continued working as a photographer after her marriage, since Adamson (1997) has her listed under her maiden name in Lower Dale Road until 1915. Ellen Beardsall of Chapel-en-le-Frith described herself as a photographer to the census enumerator in April 1881, but as no trade directory listings mention her, it is presumed she was an employee. Sarah Charles née Ball (1831-1883), widow of Derby photographer Emmanuel Nicolas Charles, is reputed to have operated the studio in Midland Road, Derby for a brief period after her husband's death in March 1863, and prior to her remarriage to her husband's former assistant W.W. Winter in mid 1864. Florence Elizabeth Levy (1879-1964) followed her father Thomas W. Levy into the photographic profession, probably in the mid- to late 1890s. She produced portraits under her own name from premises at their home in Uttoxeter New Road until her marriage to Luke Bradley in 1903. Susannah Elizabeth Robinson née Barnes (1851-1945) and her husband Frederick William Robinson (1824-1894) appear to have had a rare photographic partnership in Long Eaton between 1882 and 1894. According to Adamson (1997) she looked after the studio, while her husband handled the sign-writing, decorating, picture framing and outdoor photography. After her husband died in 1894 she moved to Nottingham and continued to run a studio in her own name until 1907. Hannah Turner of Granville Road, Swadlincote is described as a photographist in April 1881, while her husband John Turner is a photographer, but nothing more is known about the careers of this couple, who had lived in Woodville, Derby and Macclesfield over the previous decade. It is possible they were employed briefly in a local studio, such as that of G.V. Sankey. Adamson, Keith I.P. (1997) Professional Photographers in Derbyshire 1843 - 1914, Supplement to The PhotoHistorian, No. 118, September 1997, ISSN 0957-0209. I wrote recently on Photo-Sleuth of photographer Joseph Byron Clayton who, after a rather chequered start to his career in London and Nottingham, crossed the Atlantic and forged a successful niche for himself in New York - see Byron of New York. His uncle Walter Clayton (c1833-1893) was also a successful photographer, although his career was a little more sedentary, spanning three decades in Nottingham and Leicester. My recently completed brief biography of Walter Clayton is accompanied by a provisional timeline for his studio premises. I've also been able to build up a comprehensive reference gallery, comprising 59 identifiably different card designs, thanks partly to the generosity of carte de visite collector Ron Cosens (Photographers of Great Britain & Ireland 1840-1940). Some studios, such as that of Derby photographer W.W. Winter, kept the same basic elements of their designs for many years, even though having a large throughput of customers. Clayton, luckily for family historians trying to date old portraits, changed his designs frequently, and often substantially, on average every six months throughout his career. With the establishment of this dating sequence, it is now possible to estimate a provisional date for any portrait from his studio to within two or three years with a fair degree of confidence, on card design alone. Since several of the designs are very similar to those used by the Byrons, father and son, it seems likely that they used the same firm of printers, at least some of the time. Although I don't intend to display all 59 designs here, a selection will amply serve to outline the changes in card design that are so well described and illustrated by Roger Vaughan. The earliest designs of the carte de visite era were either two to four lines of text (simply the photographer's name and address) in a plain font, or a small motif, both usually centrally placed. Clayton initially used the commonly reproduced crown-and-belt emblem which had appeared on the daguerreotype cases used by early practitioners such as Richard Beard and Antoine Claudet. In his slightly later partnership with David Clayson, they changed to a crown-and-cushion motif and added several lines of text, as was the trend towards the mid-1860s. From the mid-1860s, a generic coat of arms design was accompanied by the words, "Copies of this portrait may be had," later simplified to "Copies can be had." This illustrates the appreciation amongst photographers, and their clients, of one of the most significant advantages of wet plate collodion portraiture. Keeping the glass plate negatives of all previous sittings and encouraged more business as customers returned to order copies. The late 1860s brought a shrinking of the coat of arms and the introduction of two new features - the ribbon and the ivy - which started a trend of further and further intricacy. At this stage however, the ribbon had only three tiers, and the ornate ivy was restricted to the central third of the card. In the early 1870s designs continued the trend of increasing size and complexity, but one of the most common additions were frames enclosing the previously isolated central motifs. These varied from a simple rectangular box to a series of nested double frames, often shaped, and sometimes very ornate. More text lines were accompanied by an increase in the variety of fonts used, resulting in the designs now often taking up more than two thirds of the card area. Towards the mid-1870s, Clayton used an even more elaborate broad maze border enclosing his now well established motif consisting of coat of arms and ribbons with nine lines of text, and provision for a negative number to be inserted. Sadly, although he obviously did keep records of his stittings, he very rarely bothered to include the negative number on the mount. Of almost 80 examples of his work that I have seen, only five have a negative number. These two designs, both from the mid-1870s, are illustrative of a temporary shift away from the use of motifs and emblems, and the reliance on ever more complex, ornate and decorative text, often accompanied by stylised ivy to a greater or lesser extent. In addition, the designers started to introduced slanting, diagonal and even vertical text. Some of the results were successful, others looked decidely amateurish. The conclusion of this trend saw the development of a combination of diagonal "signature," several lines of text in a variety of fonts, with enlarged and highly ornate initial letters, and greater or lesser quantities of decorative ivy. The variety of coloured inks and card was also expanded. The two designs shown above, used for cartes de viste and cabinet card formats respectively, were among the most commonly employed in the mid- to late 1870s. The design for the cabinet card, with its greater area to cover, retained the wide ornate border pattern. In the final years of the decade Walter Clayton was somewhat more adventurous, with a huge flower arrangement in red ink on orange card, his name and the studio locations relegated to a strip at the bottom. It was an unusual design, but by the turn of the decade he had returned to a more recognisable and conventional format, referred to by Roger Vaughan as "Bamboo & Roses," originally developed by Marion Imp Paris but widely copied. After a rather more sedate, refined design largely made up of text in several different font types and sizes, with a subordinate motif, Clayton returned to the more decorative style in 1883. His version of Marion Imp's "Parasol, Bonsai and Fan" design, embellished with two horseshoe magnets signifying his "Magnet Studio," was part of the growing British enthusiasm for all things oriental (e.g. The Mikado). He used it for some years, including variants printed by other card publishers. From the late 1880s and into the 1890s, numerous classical elements, such as Doric colums, lavish drapes, Greek vases, flowering plants, cherubs and toga-clad ladies began to grace card designs, particularly those for the larger cabinet format. On cartes de visite, where there wasn't quite as much space to fit the myriad of new motifs, stylisation of the classical motifs was more prevalent, and such was the case with a series of lavish designs which Walter Clayton depicted in a variety of colours in the late 1880s. Finally in the early 1890s, in keeping with a style adopted by many of his co-workers in the mid- to late 1880s, he banished all previously used design elements. Thick glossy card- white or dark green - was adorned merely whith his name and location on the front printed in gold ink. The edges of the card were bevelled, as well as being highlighted with gold ink. Walter Clayton retired in 1892, and therefore missed a few of the final developments in card design, such as more elaborate classical ensembles, art deco elements, square corners, and wide margins containing embossed patterns on the front. However, his range over a period of 32 years has a good selection indicative of the main trends. For further detail regarding card designs, I recommend spending some time perusing Roger Vaughan's study. I still use it frequently to provide a background for my own research. For this week's Sepia Saturday post, I'm going to do something a little different, although still keeping broadly within Alan's theme. This will be an opportunity for readers to do a little detective work. Regular Photo-Sleuth readers will have a slight advantage, but it's not exclusive. Anyone is very welcome give it a go, and there is a small prize for the winner! These two images are scans of photographs from my aunt's family collection - not acquired images. 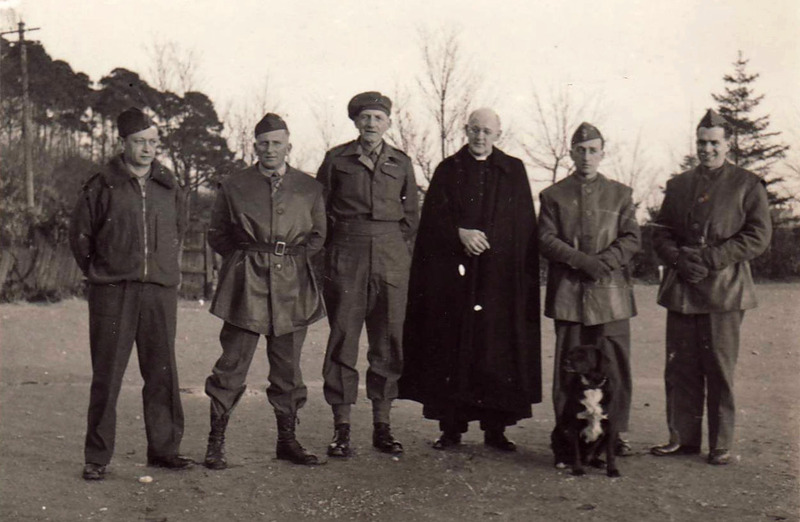 1. Who is the person depicted in the passport-style photo and standing at third from left in the group photo (full name, please), and what is his relationship to me? 2. When were these photographs taken? An approximate year or date range is sufficient. 3. What group(s) or organisation(s) did the other people in the second photograph belong to, and at what kind of place was the photo taken? I don't think I need to give you any more clues than I have already, but if nobody's getting close by the end of the weekend, I may provide a nudge in the right direction. The first reader to post all three correct answers as comments at the end of this blog post will win a free professional photohistorical evaluation of a Victorian or Edwardian portrait of their choice from their own family collection - see this sample report for an example. If nobody has answered all three correctly by the time the following Sepia Saturday goes to air (No 81 on 2 July), then I will judge the closest - or cleverest - answer to be the winner. Obviously, the more details you can provide in your answers, the better. Options available for preserving a likeness of yourself for posterity in the pre-photographic era of Georgian England were limited, unless you were wealthy enough to commission a portrait, life size or miniature. A cheaper alternative was to have a silhouette portrait either cut from black paper or painted. In fact the name itself implied a low price. French finance minister Etienne de Silhouette imposed severe economic austerity measures during the Seven Years War, and his surname came to signify anything that was done on the cheap. Auguste Edouart (1789-1861) was probably the most widely celebrated silhouettist of his time, establishing his reputation first in London and then touring England, Scotland, the United States and France. I have written previously of Mancunian William Seville (1797-1866), who made the transition from an active career cutting silhouette portraits, spanning three decades, to an arguably less successful spell taking collodion portraits (ambrotypes) at Derby in the mid- to late 1850s. Edward Foster of Derby was also a prolific artist of this genre. After travelling widely throughout England and painting silhouettes from 1809 until at least 1838, he turned to the compilation and publication of educational books and charts in the 1840s. Although Foster apparently never made the move to photographer, there is evidence that he appreciated the value of the carte de visite as a means of self promotion. G. WHITE will also take his BRONZED AND SHADED LIKENESSES, from the plain bust to the highly finished whole length figure. LIKENESSES COPIED. Keeps constantly a variety of suitable Frames for the Daguerreotype Portraits and Paper Cuttings. Although it doesn't refer to them as profiles or silhouettes, that is what these "bronzed and shaded likenesses" were. 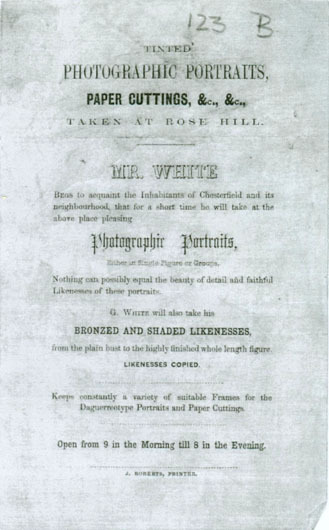 I have previously demonstrated (Payne 2008b) that this Mr. G. White, who spent a brief period cutting profiles and taking daguerreotype portraits in Chesterfield during the early to mid-1850s, is the same person as the George White (1810-1880) who operated a photographic studio at 1 Queen's Terrace, Adelaide Street, Blackpool from 1849 to 1869 (Jones, 2004). Photographic Portraits, Paper Cuttings, &c. Taken by Mr. White at his Gallery (daily), Queen's Terrace, opposite the Royal Hotel, Blackpool. Likenesses faithfully copied. Open from 7 am until 7 in the evening. It is clear that the examples described by McKechnie and Jackson (1982), all apparently dating from the early 1850s, are likely to have been by the same George White. George was born in 1810 in the Derbyshire village of Winster, near Matlock, the second of eight children of James White (1775-1854) and Elizabeth Hodgkinson. He was baptised on 28 December 1810 at the parish church of St John the Baptist. His family moved to Chesterfield between 1814 and 1817, where James worked as a gardener. Little further is known about George White's teenage years, his education or early adulthood, until his marriage at Duffield in 1834 to Ann Melbourne (1808-1895), daughter of a Belper nail manufacturer. A year later he opened a shop at number 20, Piccadilly, Manchester in September 1835, offering to "cut likenesses of ladies, gentlemen, and children; dogs, horse, &c." for prices ranging from 2/6 to 10 shillings. He remained there for seven months, and then moved to Preston where he occupied a shop at number 128 Fishergate. His prices were similar, ranging from one to five shillings, depending on whether the likenesses were full length, half length or busts, plain, shaded or elegantly bronzed. He no longer offered sittings for horses or dogs - perhaps it was too tricky to keep them still, even for three minutes. By mid-June he had built up a collection of "likenesses of many well-known individuals of [the] town", which were for sale and on display in his shop window. He announced that he would shortly be taking up engagements in Southport and Blackpool, where he would cater to visitors during the bathing season. A series of newspaper advertisements suggest by their wording that White made regular visits to Preston and Lancaster from 1836 to 1839. He probably also worked in other Lancashire towns, although evidence for these has been elusive. There is also a curious dearth of information about White's activities during the 1840s. By June 1841, he and his wife were in Bispham, north of Blackpool. Living them was George's younger brother James, aged 15 and described in the census as an artist's apprentice. Perhaps they were preparing themselves for the forthcoming summer season, although the great tourism boom was still to arrive, with the railroad, after 1846. The next sighting of George White is an 1849 entry in Gillian Jones' compilation, Lancashire Professional Photographers, which shows him with premises at number 1, Queen's Terrace, Blackpool in that year. However, it is not clear if he was already working as a photographer by that time, since Mannex & Co's History, Topography, and Directory of Westmorland for 1851 shows him merely as an artist and lodging house keeper. He was obviously still travelling to find business, because the 1851 Census shows him in the village of Church, near Accrington, while his wife and nine month-old son remained at the house in Blackpool. The handbill which advertised his services in Chesterfield was probably ordered from Chesterfield printer John Roberts in the early 1850s. Rose Hill - now occupied by the grand Chesterfield Town Hall building, shown above - was where his parents lived, at least until his father's death in 1854. By April 1861 he had returned to his family in Blackpool, where he described himself as an artist. The carte de visite portrait shown above was probably taken in the early to mid-1860s in his studio at 1 Queen's Terrace, Adelaide Street. The last directory entry noted by Jones was in 1869, and on census night April 1871 he described himself as a retired artist. Since late 1869 their address had been 23 Adelaide Street, although it is not clear whether they had moved or the street had simply been renumbered. George White died at Blackpool on 23 March 1880, aged 69, leaving his widow Ann and son Frederick George White, a banker's clerk. Many thanks to Peggy McClard for providing information about White's career as a silhouettist, and for kindly giving me permission to reproduce the wonderful image of her White silhouette. If you're interested in silhouettes and other folk art, I strongly recommend visiting Peggy's web site, Peggy McClard Antiques. I'm grateful also to Michael Pritchard and Ian Leith for their lookups, to Ann Halford for information about the Melbourne family of Belper, and to Dawn Scotting for her work on Winster families. I'd also like to thank Mike Spencer, who spotted the handbill amongst the archives at the Derbyshire County Record Office, and sent me a photocopy, thus sparking off the whole quest in the first place. 1841-1911 UK Census Collection, England & Wales National Probate Calendar and England & Wales BMD Index from Ancestry. Anon (1835) Likenesses cut with scissors, in three minutes (Advertisement, dated 25 Sep 1835), The Manchester Times and Gazette, 26 September 1835. Anon (1836a) Striking likenesses cut with scissors, in three minutes (Advertisement), The Preston Chronicle, 23 April 1836. Anon (1836b) Likenesses, The Preston Chronicle, 18 June 1836. Anon (1838a) Likenesses cut with scissors (Advertisement), The Preston Chronicle, 13 October 1838. Anon (1838b) Likenesses cut with scissors (Advertisement), The Lancaster Gazette and General Advertiser, 1 December 1838. Anon (1839) Likenesses cut with scissors (Advertisement), The Preston Chronicle, 12 October 1839. Anon (1855) Slater's Directory of Lancashire, from Ancestry. Halford, Ann (n.d.) Melbourne Tree, Ann & John's Family Histories. Jackson, Emily Nevill (1982) Silhouettes: A History and Dictionary of Artists, New York: Dover Publications, 154p, 103pl. Knipe, Penley (1999) Shades and Shadow-Pictures: The Materials and Techniques of American Portrait Silhouettes, The Book and Paper Group Annual, Vol. 18 (1999), Paper delivered at the Book and Paper specialty group session, AIC 27th Annual Meeting, June 8-13, 1999, St. Louis, Missouri. Mannex & Co. (1851) History, Topography & Directory of Westmorland, from the University of Leicester's Historical Directories. McClard, Peggy (2007) Cut & paste silhouette of a young girl carrying a basket, by White, Peggy McClard Antiques. Payne, Brett (2008a) Advertising by Photographers (1) Daguerreotypist, G. White of Rose Hill Chesterfield, Photo-Sleuth, 17 February 2008. Payne, Brett (2008b) George White of Chesterfield & Blackpool, Photo-Sleuth, 8 May 2008. Payne, Brett (2009) William Seville (1797-1866), silhouette and photographic artist, Photo-Sleuth, 17 Sep 2009. Earlier this week I posted a portrait of Derby clergyman Roseingrave Macklin, taken at the studio of James Brennen in 1862. This carte de visite was from a family photograph album belonginging to fellow photo-sleuth Nigel Aspdin, but Reverend Macklin was not, as far as Nigel is aware, even a distant relative. So what, one might ask, is his portrait doing in an album which probably belonged to Nigel's great-grandmother Mary Ann Aspdin née Dyche (c1833-1913)? A clue to answering this question lies in the collection of carte de visite and cabinet portraits held by the Derby Local Studies Library. In October 2007 I was kindly permitted to scan a selection of these for reproduction on my Derbyshire Photographers web site. One of those that I scanned is an almost exact copy of Nigel's portrait by Brennen and, in fact, is how I was able to identify the subject, since it is annotated on the reverse. Dated 1862, it was probably taken shortly before Macklin's retirement due to ill health early in 1863. Macklin appears to have visited another Derby studio - that of E.N. Charles - probably in late 1863, not long after his retirement. Instead of being attired in his clercial vestments, he is pictured leaning on a pedestal, perhaps admiring the large campana-shaped vase, in the style produced by the Royal Crown Derby China Works in the late 18th and early 19th Centuries. Although by far the majority of the portraits in Nigel's album are unidentified, it is clear that there are more subjects who are not family members. For example, two later portraits depict men wearing what appear to be mayoral chains, and there is at least one other clergyman. 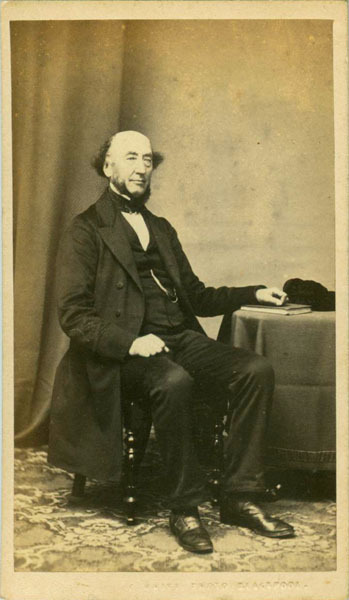 Nigel suspects that a good proportion of the photographs are of acquaintances of the album's presumed owner Mary Ann Aspdin or her husband Richard Wilkinson Aspdin (1822-1885). The carte de visite was not simply a standard card size. In 1854, Paris daguerreotypist André Adolphe Disdéri patented a method by which four, six, or even eight photographs could be exposed on a single glass plate, making the process of printing a great deal easier, and therefore cheaper. The popularised card mount size of 2½ x 4 inches was roughly the same as a visiting card, hence the name. A story of Emperor Napoleon III stopping at Disderi's studio to have his portrait taken en route to fight the Austrians in May 1859 is probably apocryphal, but it was around that time that the format started to become much more popular. Although often referred to only in fairly general terms in the photohistory texts that I have read, I get the impression that the establishment of the carte de visite as a standard photographic portrait for the ordinary person happened slightly after cdv portraits of well known people had become collectable items. From advertisements placed in newspapers, it is clear that English studios began offering portraits in the carte de visite format at least as early as March 1860, when Mayer Brothers of Regent Street, London referred to it as "this new style." The craze for carte de visites, both as collectibles and as a cheap method of portraiture, was given a substantial boost by royal patronage, Queen Victoria herself owning dozens of albums. Clearly those who would consider purchasing a hundred copies of a portrait of themselves, must have been expecting some considerable demand for said likenesses amongst their acquaintances. Although The Derby Mercury newspaper reveals no advertisements for cartes de visite as early as these, it is clear from several dated examples that Derby was not long behind the larger centres in adopting the new format for personal portraits. Nor do they appear to have been reticent about indulging in the new craze. In July 1862 stationer T.A. Johnson of 33 Victoria Street announced the recent arrival "from the leading English, German and French Houses, a very large assortment of the newest and most elegant Carte de Visite Albums." In November that year, E. Clulow and Son of 36 Victoria Street advertised a stock of carte de visite albums for sale, to hold 20, 30 or 50 portraits, and in December J.A. Rowbottom of Iron Gate offered "carte de visite albums and portraits in great variety." The first to advertise actual carte de visite portrait sittings in The Derby Mercury was the new Derby branch of the Leicester photographic firm John Burton and Sons, with a studio above Clulow's bookshop. As well as a hefty list of notable patrons including, supposedly, His Royal Highness the Late Prince Consort, "their carte de visite portraits, of which they have already taken many thousands, are universally admired ..."
A detailed analysis of early photographers operating in Derby shows that there were already seven resident practitioners at the advent of the carte de visite but, within a couple of years of its appearance, this number had doubled. Obviously portrait sittings were in great demand. The fashion for collecting albums full of photographs of royalty and the famous is reported to have been on the wane by the late 1860s. Albums compiled in the 1870s and 1880s that I have seen are indeed characterised by a somewhat lower celebrity content, and the nature of newspaper advertisements by stationers and photographers tends to reflect that trend. They are still present to some degree in some albums, even those dating as late as the 1900s, but I suspect many have been culled to satisfy the demands of collectors in more recent years. Coe, Brian (1976) The Birth of Photography: The story of the formative years 1800-1900 , London: Spring Books, 144p. Pols, Robert (2002) Family Photographs, 1860-1945: A Guide to Researching, Dating and Contextualising Family Photographs, Surrey, England: Public Record Office, 166p. Rosenblum, Naomi (1981) A World History of Photography, New York: Abbeville Press, 671p. Sepia Saturday's photo prompt this week from Alan Burnett depicts two young early 20th Century ladies relaxing on the beach in Atlantic City, but dressed in a manner that will certainly protect them well from the noon day sun. Not everyone goes to beach to swim, and if you live in this Antipodean location, then you'd be advised to go well wrapped at this time of the year (the Met Service advises 3 layers!). As far as swimming's concerned, I think you'd have to pay me. My own contribution for this theme consists of two tintypes, mounted in flimsy paper sleeves the size of cartes de visite. They are part of a larger collection of 73 loose photographs which I purchased as a single lot on eBay last year. The vendor told me that they had originally been acquired together, and my own research has given me reason to believe that they do indeed belong together. Although these tin types are not inscribed, I've been able to determine, by comparison with others in the collection in which the subjects are identified, and by some additional research, who is depicted and approximately when it was taken. Measuring roughly 69 x 82 mm, they are an odd size, somewhere between quarter-plate and sixth-plate. Both show a woman seated on the beach with two young children. She is Emily Minns née Carr (1840-1927), wife of Stoke Newington draper Charles Thomas Minns (1838-1900), and the two children with her are most likely her two eldest sons Charles Walter Marston Minns (1874-1951) and Frederick Thomas Minns (1875-1956). Her third son was born in late 1877, which suggests to me that these two photographs were taken in the summer of 1877, probably by an itinerant beach photographer. The second image, taken from a slightly different angle, includes what may be a large spoked wheel of a bathing machine, similar to that shown in an early 20th Century photograph which I posted two weeks ago as a submission for the 105th Carnival of Genealogy (Swimsuit Edition). I assumed initially that they were dressed for outdoor activities. However, now that I've looked at Stella Blum's Victorian Fashions and Costumes from Harper's Bazaar 1867-1898, I think they could well be wearing bathing suits. Although not identical - that would be so "last year" wouldn't it - the clothes are similar to those depicted in the engraving shown from July 1876, reproduced above. Perhaps someone more familiar with Victorian fashions can confirm - or refute - this. While they belong firmly in the "What were they thinking?" category in the present day, I feel they were at the height of fashion back then. I'm looking forward to a suitably eclectic selection of swimsuits among the other Sepia Saturday contributions this week. Labels: 1870s, clothing styles, hats, leisure activities, seaside, Sepia Saturday, tintypes, transport, travelling photographers, What were they thinking?